B&O 136399, an O-17 class gondola in a 1906 Pressed Steel Car Company builder photo. Do you recognize this gondola? I know you recognize the railroad name, but do you recognize the car design? It looks similar to many gondolas used in the first four decades of the 20th Century. The B&O had more than 2500 of these O-17 class gondolas listed in an October 1926 Official Railway Equipment Register (ORER). Are you surprised? As my railroad modeling is focused on 1926, I’ve found the freight car fleets of many railroads to be starkly different from their fleets of the post-WW2 years. A B&O boxcar summary was posted a few months ago that illustrated many different car designs on the 1926 roster. The full B&O fleet summary won’t fit nicely into a blog page so PDF files have been created to share the fleet information. A resource page is available where you can access individual PDF summaries as manageable file sizes to download. The gondola fleet summary is now available for your review and enjoyment. Hoppers will be covered next and the final installment will review the remaining cars of the 1926 fleet. North Side Asphalt in Pittsburgh, circa 1914. Pittsburgh City Photographer Collection 715.144303.CP. 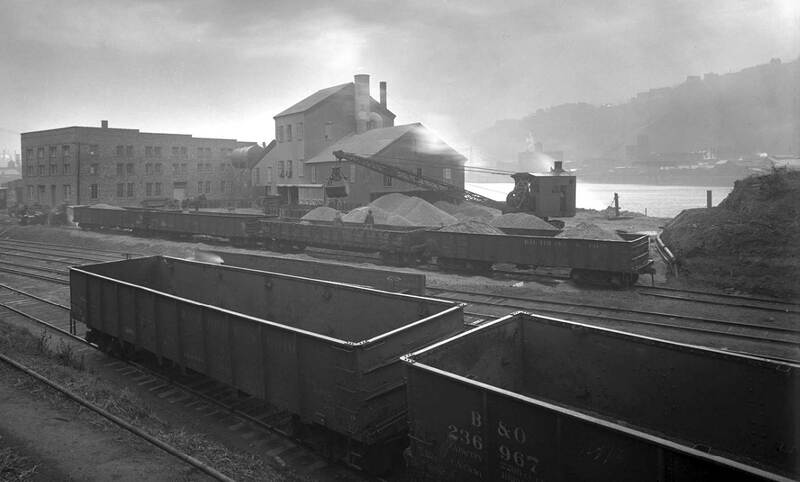 Above is a 1914 image that captured at least four B&O gondolas at a Pittsburgh asphalt plant. Images of the older B&O gondolas are not easy to find for this summary. In many cases, the original images were cropped and massaged to coax a decent view of the freight car. You can click on the link in the above caption to view the original image and compare to the one posted here. Almost every image is an adventure. Several people have assisted with this project. I thank James Mischke, Bob Witt, Ed Kirstatter, and Ray Breyer for sharing details, photos, and proofreading as these summaries have lurched ahead over the months. I think we all learned a bit more in the process. Intersting in one of the nearside goes how beat up the brake wheel is and how the inside stake pockets are beat up too. Also at least 2 different kinds of arch bar trucks. It’s wonderful the breadth of old industrial photos that one can find out of library websites–and the incredible quality of the images. The pictures are a great way of understand parts of every day life a hundred years ago; they re true primary documents and I wish they were taught as such i high school history classes. More outstanding work in the hobby Eric. Thanks for including me in the list of folks you share info with. Very good. Looking forward to more information on railroad equipment. Great work as usual. Though that word picture of a “sewer explosion” is going to be “yuck” all day today. Thanks for doing and posting to make available. Looking forward to your thoughts in Valley Forge.